The Walnut Hill General Store announces a landmark event for students of the TPO. By a special arrangement between Cyrus Roton and the publishers, we are bringing back into print in limited quantities two difinative TPO classroom books, Vintage Theatre Organ Styles by William McMains and Sound of Silents by Lee Irwin. Here it is, the all-time classic volume on how to play the King of Instruments. 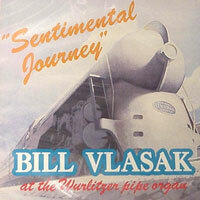 Vintage Theatre Organ Styles by William McMains. The book is a compilation of the four original volumes in the series, along with a CD containing lesson clips and performances from the vinyl records that came with the set. 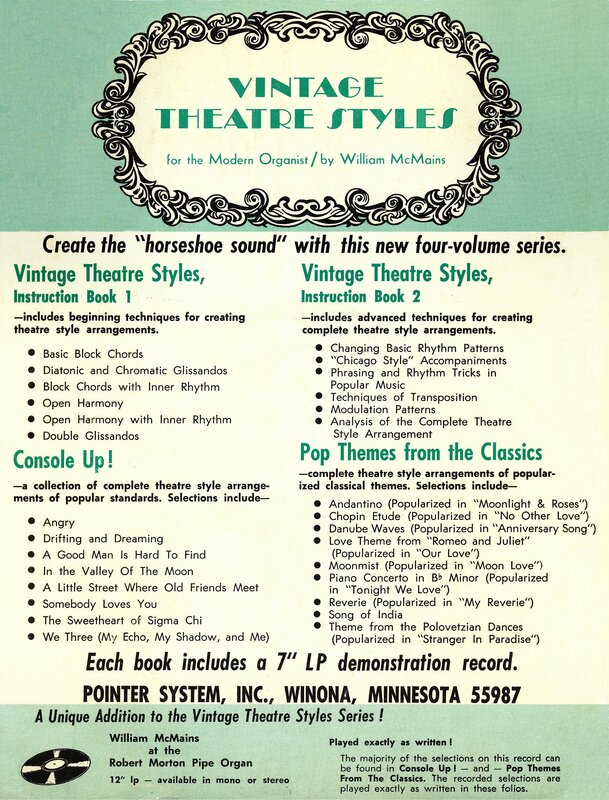 Conveniently bound in a durable comb spine volume which lays flat on the music rack, Vintage Theatre Organ Styles by William McMains will have you playing that glorious "horseshoe sound" right in your own home. Made available by a special arrangement between Cyrus Roton and E. B. 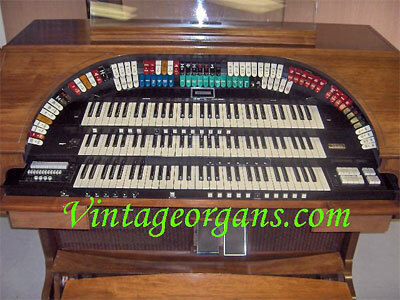 Marks Music Company, Vintage Theatre Organ Styles now available in limited quantities, so place your order now. To do so, go to the Theatre Organ Academy on Yahoo! Music Groups. If you are not a member, please join the group. Once your membership is complete, simply post a note to the group informing Cyrus that you want a copy of this essential volume for your library. The price per book/CD set inside the US is $40, $45 in all other countries. 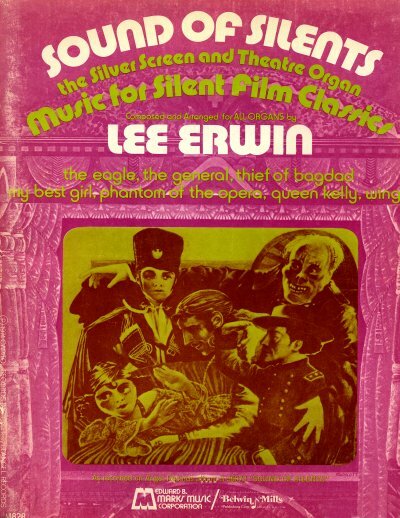 Coming soon, Sounds of Silents by Lee Erwin is a wonderful collection of scores for some of the finest silent movies ever made. 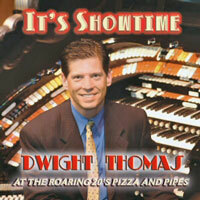 The music is arranged for all organs and includes classics such as Ohantom of the Opera and Wings. This book, long out of print, was made available by a special arrangement between Cyrus Roton and Howard Leonard Publishing. Printing is done in limited quantites so place your order now. To do so, go to the Theatre Organ Academy on Yahoo! Music Groups. If you are not a member, please join the group. Once your membership is complete, simply post a note to the group informing Cyrus that you want a copy of this essential volume for your library. The cost per book, which covers publishing fees, postage and printing, has not been established. I have completed scanning the book, and can now make a test print. I paid the specified royalties to the copyright owner, and expect to receive a signed letter giving me permission to make 25 copies. The current number of requests has greatly exceeded that number, so, I will have to request permission to make additional copies (probably, no problem). Will wonders never cease ?? Lee Erwin made a recording of the music from that book, and I think I have found a copy. Bought it tonight, on ebay. If the LP turns out to actually be the one in question, I will see if I can get permission to reproduce it, and offer a CD along with the book for anyone who wants it. Will keep you posted. This is getting interesting. 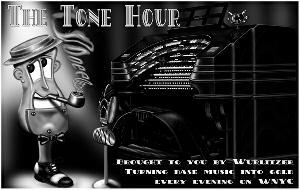 Order your very own copy of the Tone Hour poster! Only $20.00 US Plus S/H. 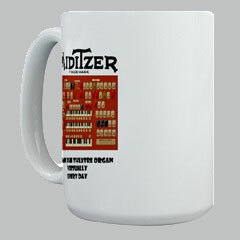 all featuring the Mighty MidiTzer screenshot logo! 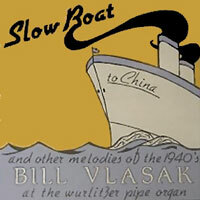 Click the picture above to purchase your copy of this fine recording for only $20, including shipping and handling. 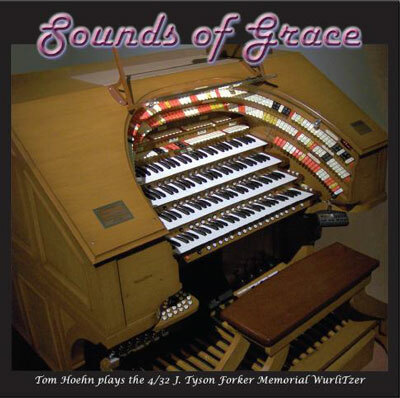 If you love the sound of the Mighty Theatre Pipe Organ and great gospel music performed by a gifted artist, this recording belongs in your collection. It was reviewed in the ATOS Theatre Organ Journal and was quoted as "having a sound that puts the listener in the best seat in the house." Tom has put a lot of hard work and money into this record and we are very proud and honored to be involved in its production, as well as being able to offer it for sale in our General Store. 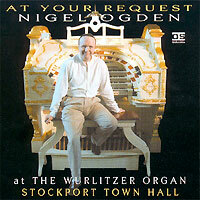 Copies of this fine recording are selling fast. There were only 1,000 CD's made for this first inital release, so get your copy today while supplies last! Click on any album below to go to the website where it is for sale. Artists featured here sell directly to the public at their own websites. This is only a link section. 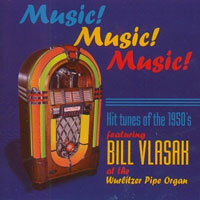 We do not sell these recordings here at Walnut Hill Productions. 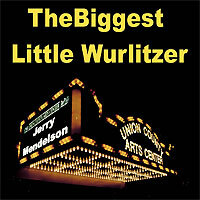 Most of these great recordings are in the Walnut Hill Productions private CD collection and we can tell you that, after close scruteny on highly accurate playback equipment, each one warrents purchase. They are all outstanding, both in quality and content. Be sure to collect them all. If you would like your recordings featured, just send a good quality copy high resolution image of the album art in JPG format, along with a hyperlink to the purchasing page, to the Bone Doctor via email and we will include it here. Click here to get started. Your Mechandise Can Be Listed Here! Email The Bone Doctor to find out how!